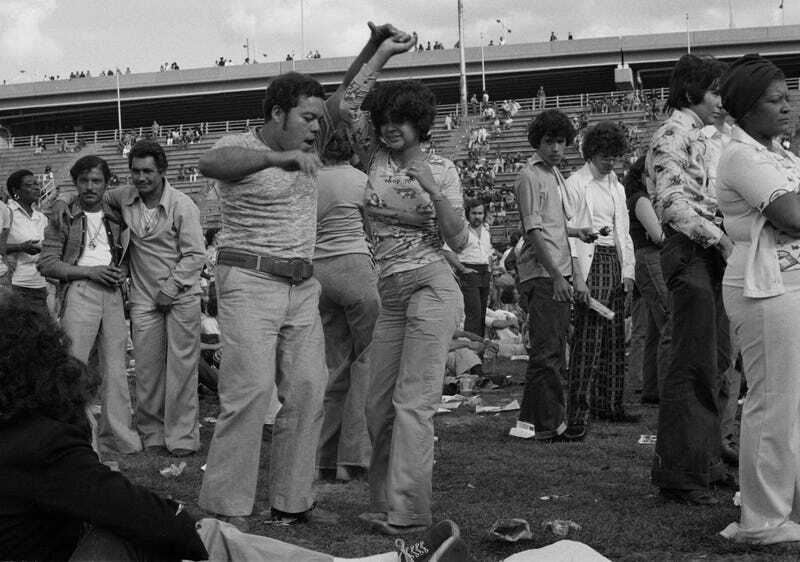 Dancers, Randall’s Island, c. 1974. Photograph by José “Yogui” Rosario. Courtesy of José “Yogui” Rosario and Pablo E. Yglesias. A new museum exhibit traces the development of salsa and the broader context that produced the musical style, specifically the immigrant culture of New York City. It looks fascinating and informative and also like it will have you extremely motivated to step up your dance skills this summer. The exhibit, which is bilingual, incorporates music, objects like concert posters and musical instruments belonging to famous artists, and of course the very cool photographs in this post. Couple Dancing Together, Central Park, Summer 1976. Photograph by Robert Iulo Museum of the City of New York, Gift of the photographer. Look at this pair of shoes worn by salsa legend Celia Cruz on her PBS TV special Celia and Friends in 2000. Courtesy of Celia Cruz Legacy Project, Omer Pardillo Cid, Executor and the Museum of the City of New York. As a preview over at the New York Post explains, New York nightlife had long been obsessed with Cuban music: “There was the rumba craze in the 1930s and then you had all of these [Cuban dance] crazes,” like the mambo and the cha-cha, author Chris Washburne told the Post. It was a popular style in big, fancy clubs like the Copacabana. (That’s the pop cultural context to Ricky Ricardo’s character in I Love Lucy.) And the city had growing Latino immigrant populations in areas like Spanish Harlem and the South Bronx, who started playing with the style. The result was the new form known as salsa. “The mercurial rise of salsa in New York was made possible only through the combination of an unprecedented cultural moment and the unbelievable diversity of the city’s musical scene,” explained the exhibit’s curator, Derrick Léon Washington, in an announcement. If you need me, I will be attempting to astrally project myself into these negatives. Palladium Ballroom Dancers, 1961Photographs by Frank Bauman for LOOK magazine Museum of the City of New York, LOOK Collection.